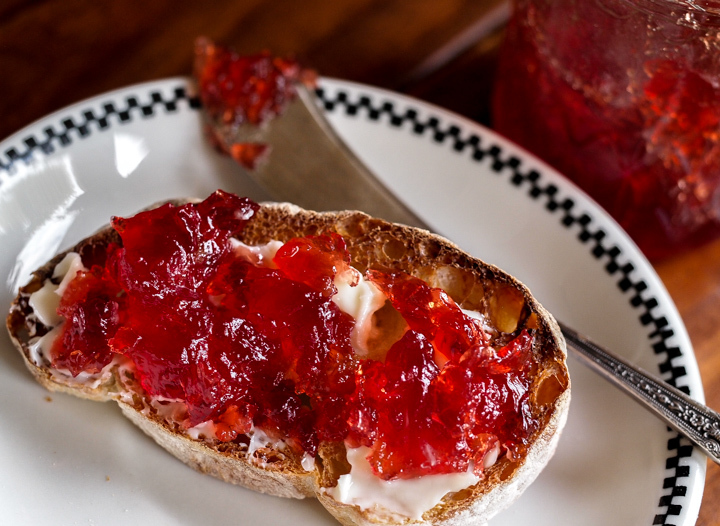 Summertime brings baskets of strawberries and this is a way to feel all creative with strawberry jam sans the Grandma Moses all day jam for the masses routine. No sterilizing, no giant kettles with scary bolts on the lid. None of that. This yields one pot of the best jam I’ve ever had (due to a couple of not so secret ingredients). It’s enough for crepes, a batch of kolaches, toast, or just spooned out of the jar. To get started you need to know the difference between jam and jammin, although I highly recommend the jammin part as background music while you stir the pot. It won’t take long. After it starts boiling some people skim the foam off the top. I don’t because I don’t think it matters but you can if you’re just standing around watching it. You don’t have to be constantly be stirring, but if you step away don’t step away for long. And remember, the more times you make this the better you get at just eyeballing the pot to know when it’s done. 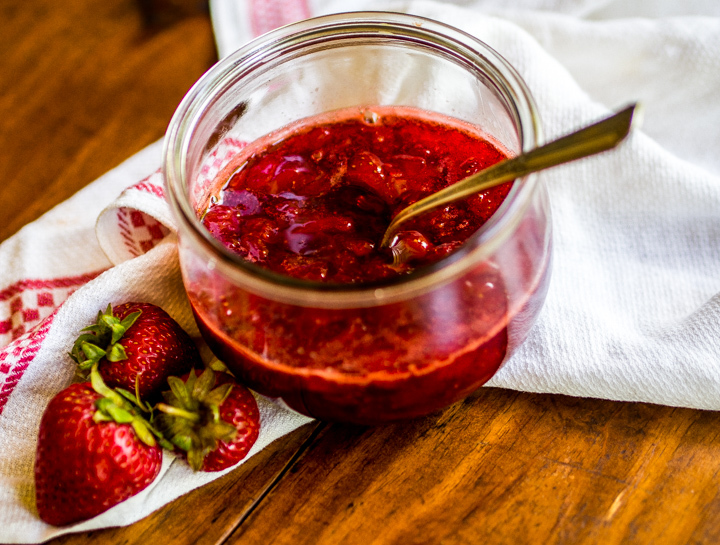 The great thing about strawberry jam is that if it’s a bit runny it’ll still be great over ice cream or cake or in smoothies or even toast. If you cook it too long stir in a bit of honey to thin it. Once you’ve done this a few times you won’t go back to grocery store jams (except maybe in the depths of winter). Place a spoon into the freezer to use for testing the jam. 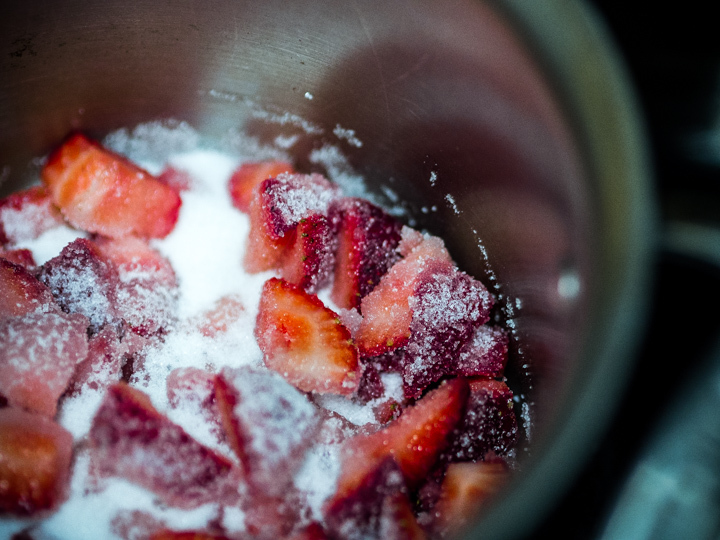 In a deep pot, add strawberries, sugar, and lemon juice and let set for a few minutes to draw out the juices. Heat and stir until it reaches a rolling boil. Boil and stir until it thickens, 10 minutes. When it starts to thicken take your spoon out of the freezer. Hold the spoon for 30 seconds then tilt it. If it slides too fast, keep cooking. If it moves slowly, it is done. Test every minute or two and do not overcook it. As the mixture reduces you should notice a ring around the pot where it has shrunk from the original volume. Pour into a clean glass jar and let set. Who remembers crabapple jelly made from their grandmother’s back yard tree? I do, and my granny wasn’t even much of a cook. Although she grew up on a farm, she ditched it early for life in the big city and this life didn’t include spending the fall in a hot kitchen canning produce. 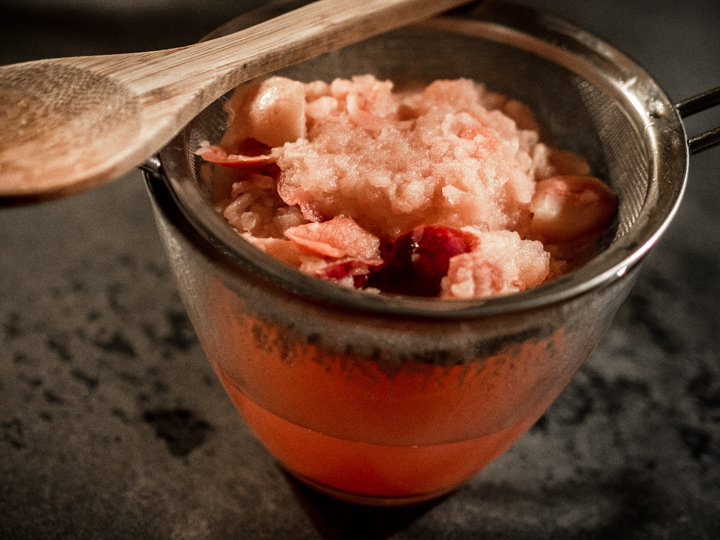 However, she always made an exception for crabapples because it was wasteful not to use them and mostly because you can’t buy crabapple jelly. Best of all her method was not the labor intensive jelly bag dripping, ball jar sterilizing ordeal most frequently described in cookbooks. This is a recipe which will yield a couple of jars of beautiful garnet colored jelly which will be your go to fall breakfast treat. And you don’t even have to peel the apples since the color comes from their skin. 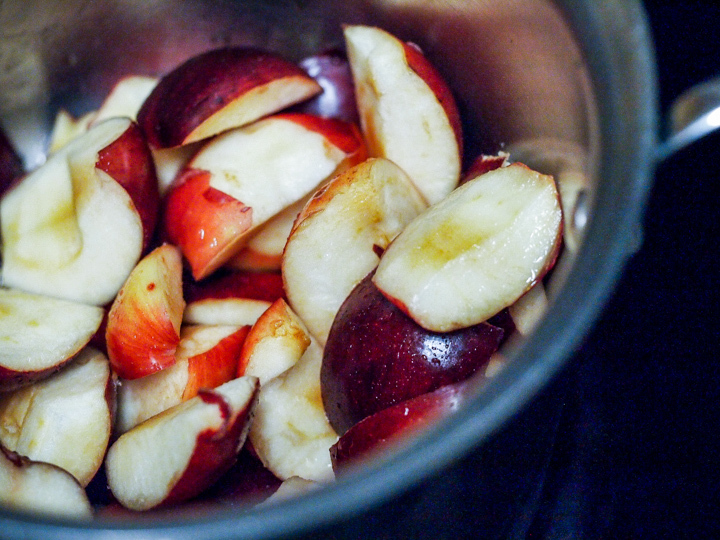 Start with two pounds of apples cut into quarters and cored. Dump them into a pot with just enough water to cover. Since the apples will float you can put a plate on top and then pour in the water or just guesstimate like I do. Whatever your method it should not be a giant pot of water with a few floating apple carcasses. In other words it shouldn’t look like a ferry accident in a third world country. Next turn the heat to medium and boil down to mush, about 20 to 30 minutes. You may stir vigorously or not as you please because at some point the fruit will fall apart like a cheap suit and then it’s done. Most of the liquid will drain out in half an hour at the longest. Resist the urge to press down on it with a spoon or you will release solids into the juice which will cloud the final product. Keep doing this until all the mush is drained then pour into a pan with the sugar and lemon juice. Boil on medium heat until it coats a spoon. Ideally this spoon will be a sterling specimen which you’ve put into the freezer ahead of time. Once coating is achieved pour into clean jelly jars and refrigerate. You’ll also note that no pectin is called for. That’s because apples (all varieties) are packed with it and congeal well without it. For this reason the jelly should be barely off the heat when you pour it into the jars. And that’s it folks. Easy small batch jelly from your own harvest. 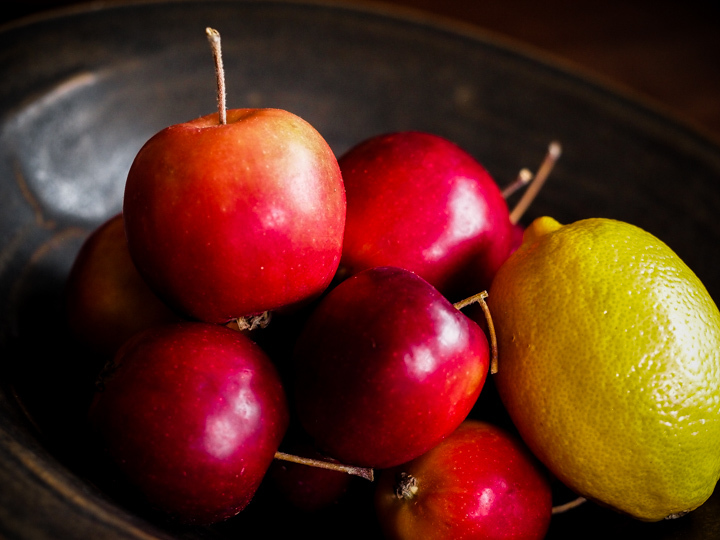 Remove stem ends, core & cut up apples into quarters. Place in a pot & cover with water. Boil over medium heat until apples are mush. 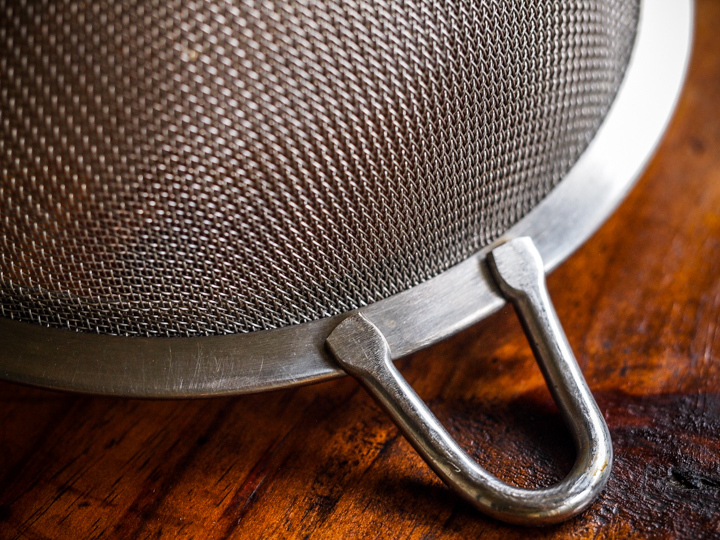 Drain through a fine mesh strainer for about 20 minutes. Do not press down on the apples as doing so will cloud the jelly. Discard the cooked apples. This should yield 2½ cups juices. If there is less juice you will need less sugar. Taste as you add. Too much sugar dulls the flavor. Once all the juice has drained remove to a pan, add sugar, lemon juice and boil over medium heat for 20 to 30 minutes until thickened. Mixture should coat a spoon lightly. Let cool for a minute or two then pour into jelly jars. This sets up fast so don't leave it in the pot for longer than that. 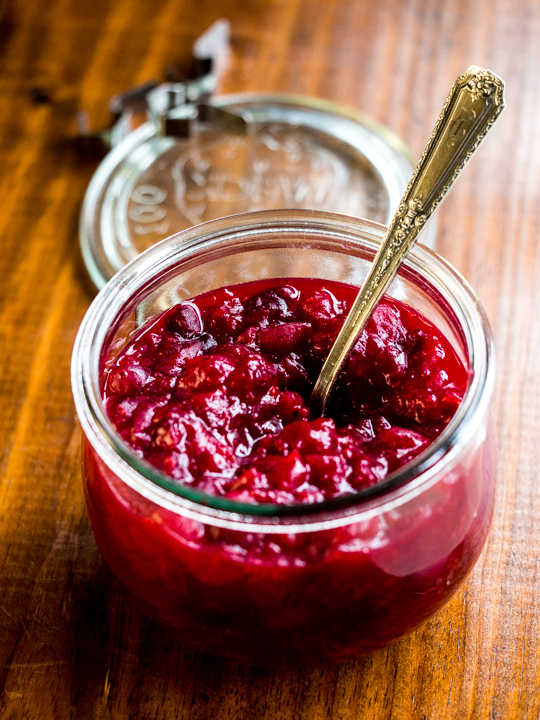 This is the cranberry sauce for those who like it chunky and not too sweet. Ocean Spray used to make something just like it when I was a kid – came in a glass jar and was a huge improvement over the gelatinous sugary pureed stuff that tastes like the metal can…. Unfortunately, they either stopped making it or I stopped being able to find it anywhere. Which turned out ok since this is much better (than can or jar) and it only takes about 20 minutes start to finish. The orange juice plus rind is a great addition and the fresh bay leaf (which I get from my friend Sharon) adds interest. The only trick to this is make sure you stand over it till it comes to a boil, then lower the heat, set the timer and don’t let it bubble for more than 15 minutes. If it starts to thicken after 12 or 13 minutes go ahead and cut the heat. You can leave it in the pot to cool, just make sure it’s off the burner. I once made the mistake of letting it boil too long and somehow through the weird alchemy of pectin congealing, the sauce sets up after 15 and totally falls apart after 20 or 30. I attempted to salvage my runny sauce by adding, not gelatin because I didn’t have any, but cornstarch. This gave it the rubbery consistency of a week old diner pie and of course it was milky and unappetizing. So the lesson here is that a watched pot will boil to perfection as long as it doesn’t boil too long. Put cranberries, sugar, and water in a pot and give it a stir to dissolve the sugar. Zest the orange rind & then squeeze the juice into the pot. Bring to a boil then cut the heat to medium and let cook for exactly fifteen minutes. You can halve the recipe and it will make the amount shown in the picture. If you do halve it go ahead and use the whole orange, juice & zest. Optional add ins for flavor could be cloves or cardamom seeds. If you don't have a cinnamon stick add a quarter teaspoon of ground cinnamon, not more. A little goes a long way.